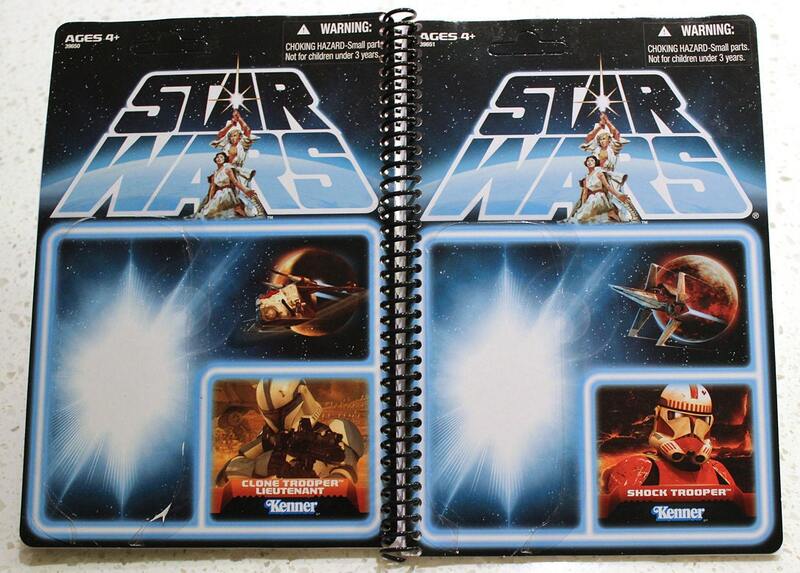 50-page, blank paper, spiral-bound notebook with "Lost Line" Vintage-Style Kenner cardbacks featuring Shocktrooper on the front and Clone Trooper Lieutenant on the back. Note: All items are in-stock, made-to-order, and take 2-3 business days to prepare and ship. Cardbacks shown in photo(s) may or may not be the actual cardback(s) used in your order, but ALL cardbacks are 100% authentic and original. No reproductions! Great idea and great product. Just as described and shown! Thank you!! Fantastic!! I love this item. Payment is due within 48 hours of purchase. Items may be cancelled within the same 48 hour period. All notebooks are MADE TO ORDER, so all sales are final once the notebook is created and the order may not be cancelled. All items are in-stock, made-to-order, and take 2-3 business days to prepare and ship. Cardbacks shown in photo(s) may or may not be the actual cardback(s) used in your order, but ALL cardbacks are 100% authentic and original. No reproductions! I am HAPPY to do custom orders. I have a pretty big inventory, so if you have any favorite characters/combos you'd like to see on your personalized notebook, just contact me with your wishes. In some cases if I don't have the cardback you need and I may need to research suppliers. Price quotes will be provided for ALL custom orders based on current inventory and/or if a particular cardback is not readily available. Quoted prices must be agreed upon by the buyer via e-mail and paid in full via PayPal before the notebook is created and shipped. Because these items are MADE TO ORDER, I will allow exchanges, but not returns. U.S. SHIPPING POLICY: Buyer to pay $4.00 for USPS First Class Mail with Delivery Confirmation for the first notebook and $1.00 for every notebook thereafter in the same order. (Priority Mail Shipping with Delivery Confirmation is also available for $5.00 for the first notebook, and $1.25 for every notebook thereafter in the same order). INTERNATIONAL SHIPPING POLiCY: Shipping outside of the US to Canada, UK, and Australia only. See individual product listings for International Shipping rates. SHIPPING TURNAROUND TIMES: Because all items are MADE TO ORDER all items will be shipped out to buyers within 2-3 Business Days of receipt of final payment. If you would like to see what your final notebook will look like before it's produced, I am happy to take pictures of the cardback(s) you are thinking of purchasing for your notebook before the order is created and fulfilled. Please go to: http://www.flickr.com/groups/swnotebooks/ for sample images of completed and delivered notebooks.